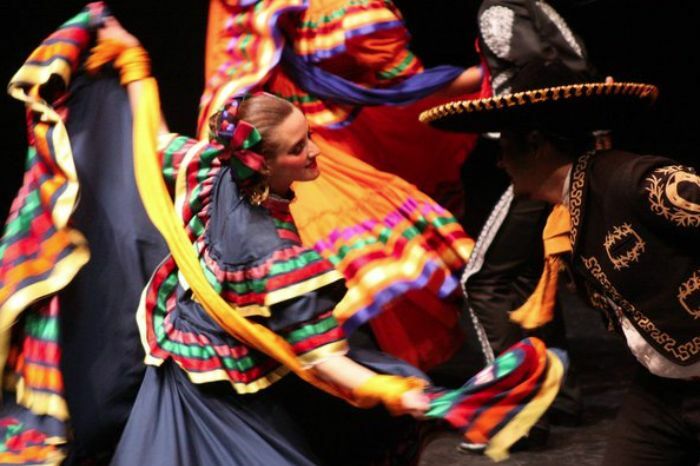 Folklorico's elaborate costumes and dances are specific to the different regions of Mexico. "I was really struggling. There were a lot of times I wanted to go home," recalled Gomez, whose neighbors were predominantly Mexican American and Central American. "My household speaks Spanish at home, and not hearing that here was hard. I had culture shock." All of that changed winter quarter, when Gomez discovered Grupo Folklorico Los Mejicas, a student-run dance troupe that celebrates the regional music, dances, and traditions of Mexico. "I'd never done it before, but I wasn't the only one without dance experience," said Gomez. "At first I was so lost, but I stuck around and gave it a chance. It was more than dance. Everyone was willing to help me out. I saw I wasn't the only one who needed a home away from home." Today, Gomez, a second-year Porter College student, is one of 51 members of Los Mejicas. The troupe meets three days a week and performs regularly on campus and for elementary and high school students, festivals, and special events hosted by organizations like the Museum of Art and History in Santa Cruz County and beyond. Gomez coordinates the group's events and puts in an extra three hours or so of practice each week ("To grow as a dancer, you have to practice outside the class," she said). Students can earn two credits per quarter, or they can dance just for fun. Last fall, Gomez was happy to welcome new members. "I reassured them we're all here for each other," she said. "We all teach each other." One senior confided that she wished she had heard about Los Mejicas earlier. "Mejicas provides a safe space. It's like a second family," said Olga Najera-Ramirez, professor emeritus of anthropology, who has served as faculty advisor to Los Mejicas since 1996. A UCSC alumna (B.A. Latin American Studies and history, Merrill '77) who danced with the group as an undergraduate, Najera-Ramirez said Los Mejicas "inspired me to become an anthropologist." "The original idea wasn't to be a performance group, but it was something we enjoyed doing," she said. "When I was a student, there weren't many minorities on campus, so it was a place to enjoy Mexican culture, food, and traditions—although we're open to everyone. We always have been. We've always had non-Chicano participants." Twelve of this year's 51 dancers are men, and the performance calendar is busier than ever, with shows five or six times per month. The troupe is celebrating its 45th anniversary this spring, with a reunion scheduled for April 29 during Alumni Weekend. "We had more than 400 alumni at our 40th reunion," said Najera-Ramirez. "Anniversaries are a way of connecting with alums who helped build the group. Few people choose to go into dance professionally—our graduates are doctors, teachers and lawyers—but what they learn serves them for the rest of their lives: team building, leadership, public speaking." Los Mejicas provides much-needed community for students like Gomez who are looking to find their footing far from home; the dancers in turn are wonderful role models for their audiences and ambassadors for the campus. 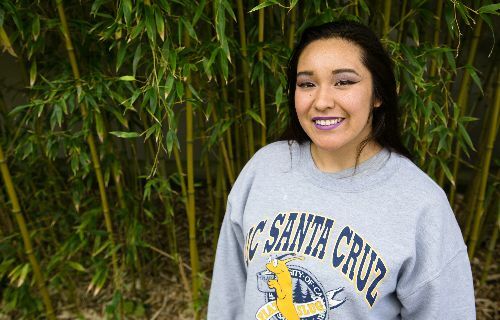 "Wherever they perform, on campus or at high school assemblies, parents come up and say, 'I didn't know UCSC has this,' " said Najera-Ramirez. "They are pleased to see that Los Mejicas fosters an appreciation for the beauty and diversity of Mexican culture." Gomez embraces the cultural aspects of folklorico dance, with the colorful costumes and elaborate make-up. "I grew up watching it, so I knew what it was. But I didn't know how intense the footwork is!" she marveled. Brandon Melendez remembers quietly tapping out the intricate footwork during classes. "The footwork was very difficult at first," said Melendez, now in his fourth year with Los Mejicas. 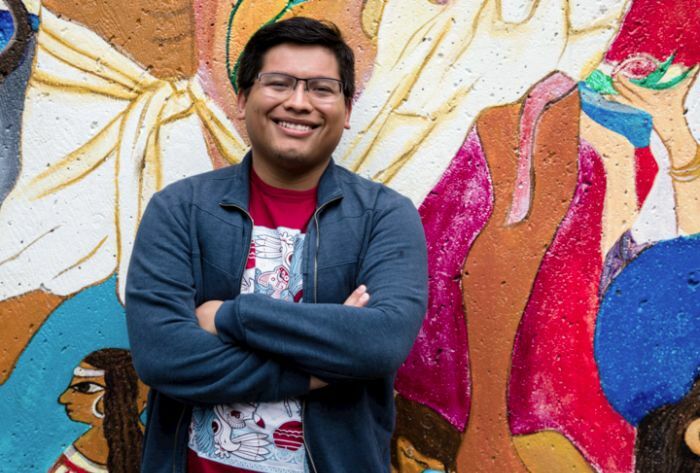 Now a co-director of the group, he, too, says folklorico helped him connect with his cultural roots. As a classical studies major, Melendez has always enjoyed the art of storytelling, and he appreciates the themes of courtship, marriage, and rejection that are represented in folklorico's traditional dances—as well as the social aspect of performing. "I started out shy and timid, and now everyone calls me The Loud One," says Melendez, smiling. He embraces gritos, the tradition of shouting with joy and pride while performing. "I definitely grew as a person. I like being loud, showing that pride." Los Mejicas members work hard, spending hours rehearsing and performing together. They forge lasting friendships—and sometimes more: the troupe has produced several marriages over the years. "The group draws you in, but it's the people who make you want to stay," he said. For Gomez, all the hard work comes together when she performs. "You become that proud dancer," she said. "You go into a different world, where the adrenaline and nerves and excitement fade away. Once you're actually dancing, it just feels amazing." The public is invited to celebrate the 45th reunion of Los Mejicas on April 29 during Alumni Weekend; the event, which begins at 6 p.m., includes dinner, live music, a short performance, and a revolving slideshow, followed by a social dance. Advance registration is requested. The annual spring concert will take place June 9-10 in the Mainstage Theater. Doors open at 7 p.m.; show starts at 7:30 p.m.